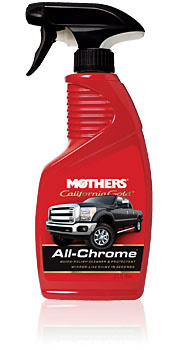 Mothers® Back-to-Black® Trim & Plastic Restorer aerosol is our simplest trim care creation yet. Drawing upon our industry proven Back-to-Black® surface care technology, this simple mist-on and walk away dressing provides unmatched results and convenient, effortless application. Light oxidation, wax residue and surface film are no match for this surface coating, instantly bringing back that dark, factory-new sheen to any sun-burnt plastic, rubber or vinyl. Once fully cured, you’re left with a long lasting, protective barrier, preventing further deterioration caused by sun, smog, ozone, water, chemicals and airborne contaminants. It makes quick work of tight, difficult-to-reach areas such as grilles, fender wells, and even engine hoses and other plastic components that are tucked down deep under your hood.